Brainwashed - Die Wilde Jagd, "Uhrwald Orange"
Die Wilde Jagd, "Uhrwald Orange"
The Uhrwald ("Clockwood") -- a place of dreams and sounds, with its own sense of time. Channeled into his band Die Wilde Jagd, Sebastian Lee Philipp's obsession for this place unleashes a uniquely spellbinding project of minimalist, tenebrous intensity. 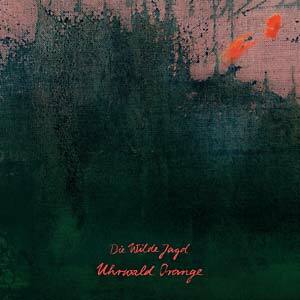 Recorded in the studio which lends its name to the sophomore album, Uhrwald Orange weaves a dense, atmospheric web of drama, romance, ecstasy, and melancholy. Die Wilde Jagd released their debut album in 2015 (BB 203CD/LP) when Philipp teamed up with producer Ralf Beck (Nalin & Kane, Unit 4). Beck excused himself from "daily business" shortly afterwards, but he retains an important influence on the new LP: Not only did he co-produce and mix the tracks (joined by Australian producer Kris Baha in the final mixdown process), but his collection of vintage analog synthesizers, drum computers, and studio equipment gives Die Wilde Jagd's music its unique, dexterously crafted character. Philipp locked himself in Beck's Uhrwald Orange studio for nights on end to transfer sonic interpretations of his world of images to tape: a nocturnal flight into the subconscious, into a strange world ("Fremde Welt") where ghostly creatures reside -- acid horses, bat boys, 2000 elephants ("Säuregäule", "Flederboy", "2000 Elefanten"). Flemish artist Frans Snyder (1579-1657) provides inspiration with his painting "Animals of the Night" as does the 14th-century collection of songs "Llibre Vermell de Montserrat". Philipp's repetitive electronic sequences include Mediterranean mandolins, psychedelic bass/guitar loops, Georgian choirs, and rattling North African krakebs. Medieval church music mixes with European folklore and improvised jams on this aural journey through the Orient and Occident -- from dark Nordic woods to the Eastern dawn. Philipp offers an insight into his hermetic world of ideas on eight tracks, enriched by sounds of nature captured on a trip through Portugal. Uhrwald Orange is, of course, also Philipp's ode to the recording studio itself, to the analog gear and the ubiquitous EMT Plate reverb. This is where he could realize the sound he imagined, all within Beck's own framework of compressors, preamps and signal paths. Philipp on his work in the studio: "I want to make the equipment in the studio sing, build a world of sound in which every tone, every effect has its own voice. . . . Every element can be found amongst the dwellers and natural forces of the 'Clockwood Orange'."